All throughout the book, characters make decisions based on optimism, ambition and pride. And all throughout the book, circumstances change, realty and seeming unreality intrude, and the much more interesting struggle begins: the real hard work of building up your successes in America. Colleen Doran's art is magnificent and often breathtaking in Amerikay. She has a glorious eye for detail that seems borne out in everything from the shoes that the immigrant men wear to the vast cityscapes that she draws. There are several cityscape views that are absolutely breathtaking. Despite that eye for detail, Doran is also terrific at drawing the characters in the book. Even secondary characters seem full of life and energy, occasionally threatening to jump off the page. Nick and Daniel, did you like Gone to Amerikay as much as I did? Daniel: I did like this book, although maybe not as much as you did, Jason. This is a big story and it requires big guns to pull it off. Both Doran and McCulloch bring out their respective howitzers in attempting to blow up this tale, but their aim, at least for me, was just slightly off-target. I completely agree with you that Doran's art in Gone to Amerikay is an amazing thing to behold. The detail she imbues into seemingly every decision she made on this book is a testament not only to her talents, but also to her commitment to this story. I was also impressed with McCulloch's ability as a writer to interweave the three storylines in the book. It took awhile to put all the pieces together, and it does rely on a rather dramatic bit of plot manipulation, but McCulloch doesn't seem to overly force the situation in order to achieve his goals. Nor does he ever write down to his audience, which I always appreciate he trusts his readers to be able to follow what he is doing without ever being heavy-handed. I guess where I have my reservations is that I wanted this story to transcend the immediacy of the characters a little more than it did. As a character driven piece, it told what could be a universal tale in a more constrained manner than I had hoped to read. I don't mean to minimize what McCulloch and Doran have accomplished with Gone to Amerikay in any way, I think I was just holding it to a higher standard given what they were trying to attempt. Ultimately, that may say more about me as a reader than them as creators, though. Nick: While I understand your criticism, Daniel, I feel like Doran's excellent contribution more than overcomes the occasional forays into cliché that the story takes. I also feel that part of that offness you're picking up on actually has more to do with the structure of the story, which is in many ways a postmodern Irish folktale. 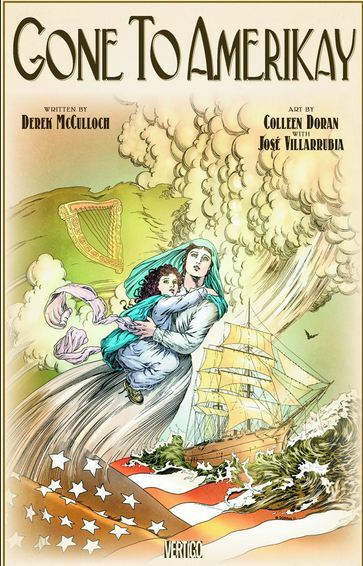 McCulloch has a clear reverence for that style and as much as the story mirrors modern examinations of Irish immigration like In America, its true genetic structure is more in line with the classic Irish folklore these characters reference and recall throughout the story. As such, there's a heavy reliance on coincidence and fate that you might not otherwise expect from this kind of Vertigo release. The pleasure comes in the way that aspect of the graphic novel is juxtaposed with Doran's often gritty and grimy imagery as well as in the way it just as frequently syncs up with the mythological elements. Without ruining anything, the twist that happens in the final third of the book puts a lot of the folkloric symbols in Doran's art into perspective, resulting in a surprising yet comforting culmination of all three eras of the story. Audiences of our era are perhaps naturally reflexively cynical about stories that lean so heavily on coincidence, but within the confines of what is arguably a 21st century folktale, it makes perfect sense and I'd wager that readers who are willing to return to the story again and again will find countless rewards for their diligence and awareness in much the same way that classic graphic novels like Watchmen are designed for careful readers who are willing to let themselves get taken in by a well-designed structure built around mathematically precise "coincidences" rather than question the reality of that structure. Even so, there's no denying that the biggest impact of the story comes not from McCulloch's great, methodical scripting but from Doran's dazzling art, which adds further evidence to the argument that she deserves to be held up as a modern master. Her treatment of such a large cast of characters, spanning literal centuries, is something to behold, as she makes every character, no matter their place in the story, stand out as something completely unique. And has already been pointed out, the life she breathes into New York itself is impossible to ignore-- without depending on obvious signifiers, she makes every era of the story completely real, like she had somehow become possessed by the characters she's illustrating and was thus able to faithfully reproduce their experiences. Jason: The city of New York is as vivid a character in Gone to Amerikay as the characters that Doran and McCulloch breathe life into. And as you say, Nick, that vividness comes not just from the breathtaking vistas that Doran presents or the precise historical detail with which she fills every scene, but also the masterful way that the imagination always seems to be hovering around the edge of every scene. This is very much a book about people who feel alive and vivid, who have strong and active inner lives. There are lots of scenes in Amerikay that are centered around characters being creative, singing classic folk songs and creating their own takes on them. Just as every generation of immigrants tells their own song, so too in this story does music tell its own story when sung by each different generation. The music has different meanings, reflects differently into each character's life and reflects the future and, especially, the past of the specific characters, the events they symbolize and in many ways the history of Irish people in America. And it's important somehow that that embrace of art happens in an almost supernaturally vivid version of New York, the city of immigrants and the city of arts. New York is a place where people can change and become someone else -- a Geoghegan becomes a Lefkowitz; a Jewish immigrant becomes the matriarch of criminals in New York City; the son of Lithuanians becomes a record company executive; and a humble Irish singer can become possessed by the spirit of the past and become able to live his dreams. And yeah, as you say, Daniel, these are not uncommon stories and they're stories that we've heard told for many years. But to me, the vivid liveliness of the characters in these three interweaving stories does transcend the characters themselves and become a wonderfully new take on Irish folklore and the Irish immigrant experience -- or as one character points out, the story of all immigrants to America. Elkin: Don't get me wrong guys -- as I said, I was enormously impressed with this book and was in jaw-dropping awe of the expansiveness of the art and the story. Gone to Amerikay is a wonderful example of the possibilities of the medium. I will say it over and over again, comics can be as valid a platform as any for the creation of great, transcending, human stories and I will toot this horn over and over again until the cops come and cite me for a noise violation. McCulloch and Doran have created a work of art, there is no denying that, and I think it succeeds on every level. My only reservation about the book is that for me -- and only in comparison to other works dealing with these particular themes -- it just didn't climb the ladder high enough. It's not like I found anything lacking, it's just that as I was reading it, I started hoping for there to be even more to it. This is the great American story. It is a tale of how individual struggle helps manifest a national sensibility. Gone to Amerikay is the big meal, as it were. I ate it. It was delicious and I enjoyed every bite, yet somehow I just never got completely full. But this is really just a byproduct of my own expectations. The fact that I happen to be currently teaching an American Literature class which has completely immersed me in these sorts of themes probably added to this sensibility. Hanover: I can see how immersion in these kinds of stories could potentially rob this particular one of its uniqueness and immediacy, especially since, as we've pointed out, it relies on slightly updated configurations of classic tropes. But I believe what makes me personally more susceptible to its charms is that I caught the bug of its creators' passion. That crucial secret ingredient made it connect with me more because I could tell how intimately connected to and in love with this story McCulloch and Doran are. For readers, that could likewise make the difference between enjoying this graphic novel and loving it themselves, but I could see it having deeper meaning for those who can connect with the characters in their own lives, in their own ways. It's probably not a coincidence that I loved this story and recently went on my own epic American journey, though it was admittedly nowhere near as far or as harsh a trip as what these characters went through. Yet that seed of personal relevancy -- in this case making a trip to a city I believed in and experiencing my own personal tragedy not long after getting here -- brought out deeper meaning that there'd be no reason whatsoever for you to experience yourself, Daniel. But that's the power of art, isn't it? To make you feel things on an individual level that cause you to have a completely unique experience, separate from what others viewing the same work may have.